Apologies for not posting earlier! 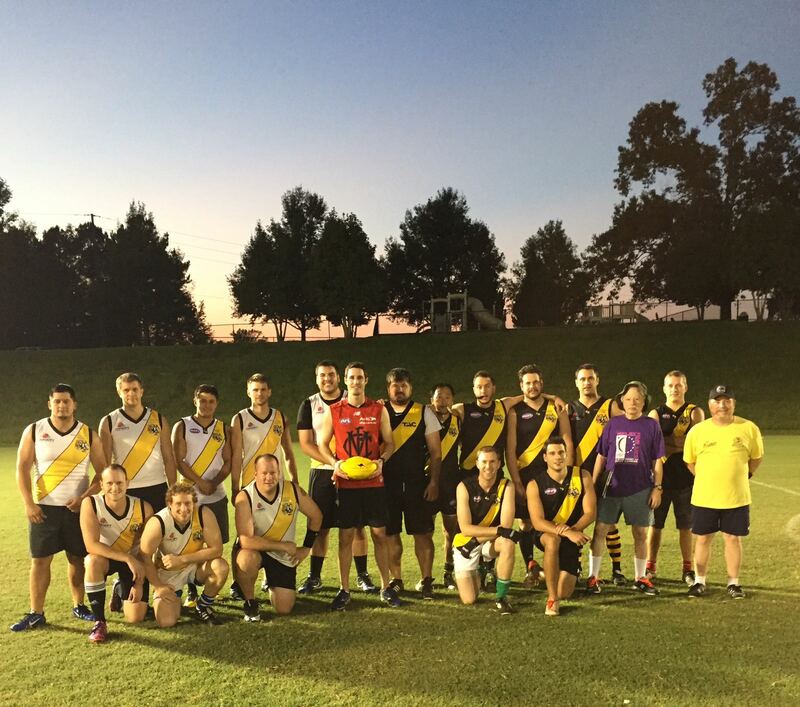 Towards the end of August, the Atlanta Kookaburras traveled to Tiger territory for a gorgeous Saturday night game. The match was hosted at the beautiful MAC Sport and Entertainment Center with recently renovated fields. The NC Tigers had a huge showing of roughly 30 gents, so we gave a few to the Kookaburras. The first quarter was relatively even until the first goal was scored by David Seymour, an Englishman and a great addition to the Tigers. The NC Tigers began to pull away in the second and third quarter, but some adjustments on the Kookaburras side in the fourth closed the gap, but it wasn’t enough as the Tigers won with a 20-point lead! Atlanta Kookaburras look for revenge against the mighty Tigers! Snacks and beverages will be served at the MAC after the game. Don’t miss out on a great night of Aussie rules football! See you there! Huge win against the Philadelphia Hawks; 48-44! Last Saturday was a day for the books! 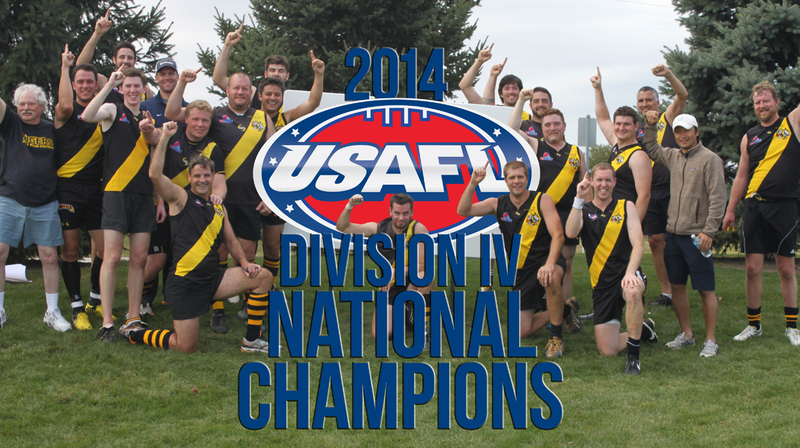 The NC Tigers traveled to Philadelphia to take on the Philadelphia Hawks Australian Football Club! 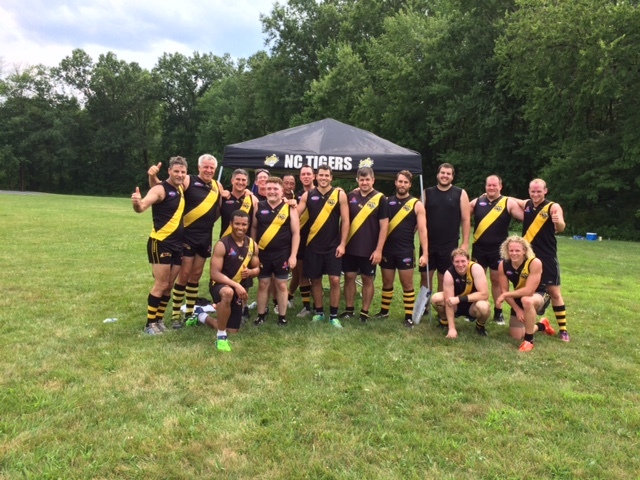 The Tigers brought a small team of only 16 players which allowed for two subs and with veteran players Nick Camilleri and Scott Bradley out of the picture, the NC Tigers still brought home a “W” with a final score of 48-44. Everyone contributed with Andrew Wesche and Stuart Mckenzie making huge stops to secure the back line. New comer Mark Washington dominated one of the mid-field wing positions. Nelson Santos and Austin Doerr each scored three goals and old-timer Albert punched one through as well! The Tigers are pumped-up and hungry to take on the Atlanta Kookaburras Australian Rules Football Club on August 26. Plan accordingly to come out and see the mighty NC Tigers! Details to come. 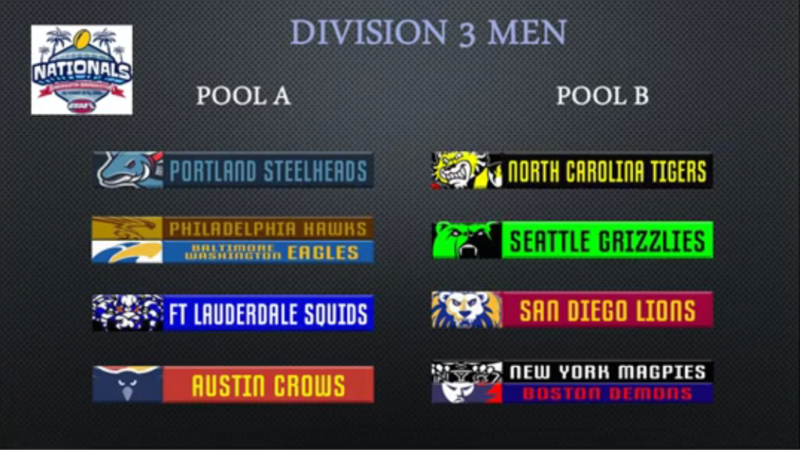 2017 USAFL Eastern Regional Tournament this Saturday! Join us this Saturday for the 2017 USAFL Eastern Regional Tournament! The first games begin at 10 AM at the North Carolina State University Miller Fields. NOTE: From Western Blvd, please enter onto Morrill Dr and park in the parking lot next to the NCSU Natatorium or park off Morrill Dr. Morrill Dr. wraps behind the front entrance of the event. Hosted by Carolina Ale House in beautiful downtown Raleigh. NOTE: Please grab a wristband at the entrance as it signifies to the staff that you are part of the USAFL group. 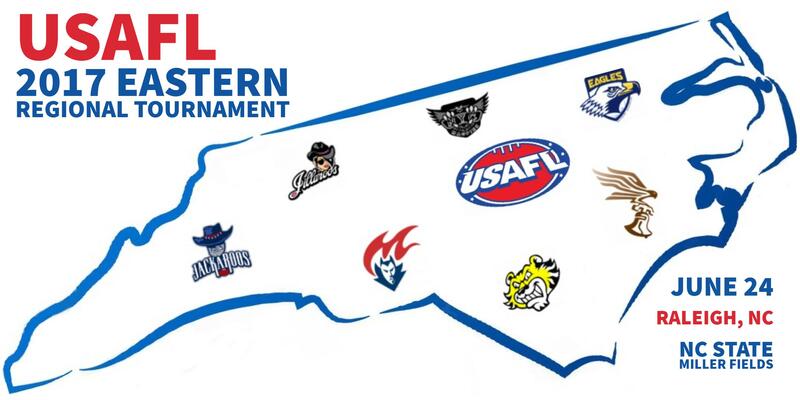 NC Tigers host the 2017 USAFL Eastern Regional Tournament! 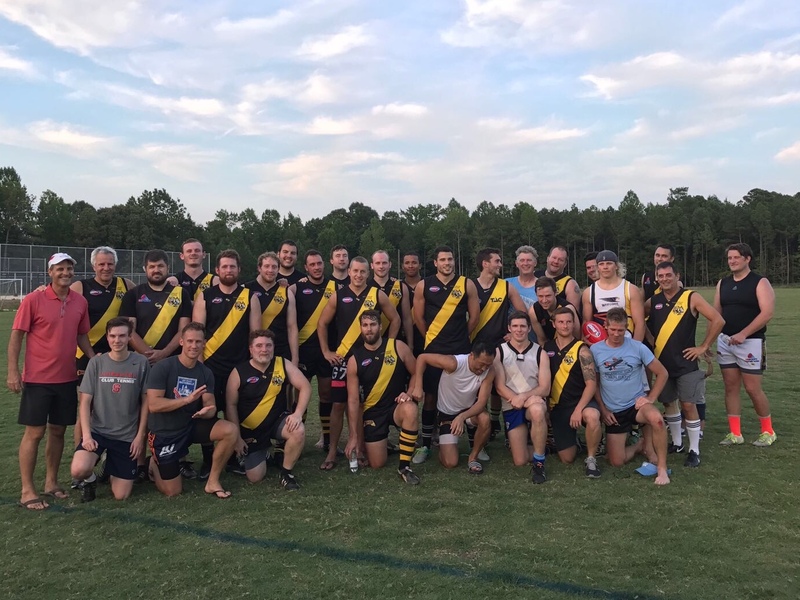 The NC Tigers Australian Football Club is excited to announce that the 2017 USAFL Eastern Regional Tournament will be hosted in tiger country in Raleigh, North Carolina on June 24. The tournament will be held at the fantastic grounds of Miller Fields on North Carolina State University’s beautiful campus. This will be a great chance to catch some Australian football action as six men’s and four women’s teams across the East Coast will be in attendance. In addition, celebrate with the players after the action in beautiful downtown Raleigh. Stay tuned for additional details! The season has begun with a win! 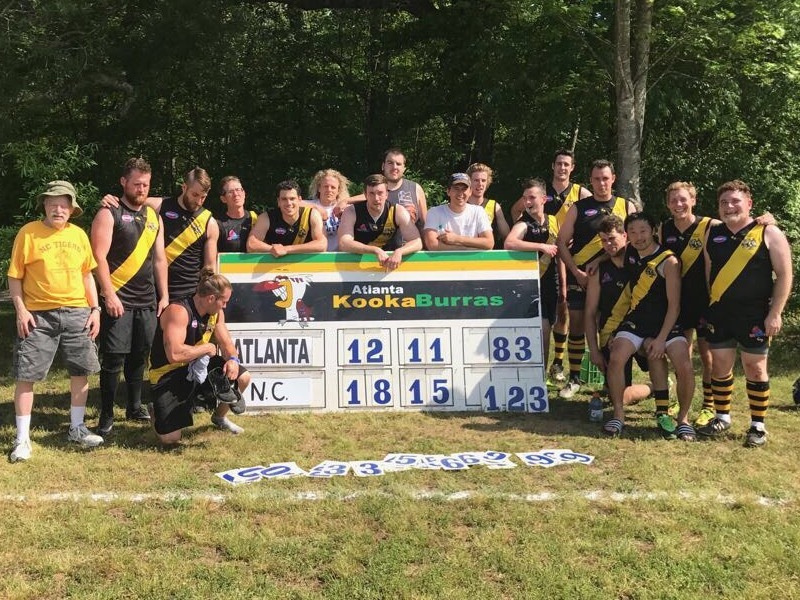 The NC Tigers rolled into Atlanta last Saturday with numbers, hungry for some Kookaburras! It was a high scoring game with a heated battle in the 1st and 2nd quarter, but after some scuffles in the 3rd the mighty Tigers began to pull away for a final score of 123 to 83. Some notable talent up front by Austin Doerr as he scored the most goals for the Tigers as he was setup by Andrew Piner after some great crumb work. In addition, two North Carolina State University exchange students, Anthony and Aaron, from Aussie land joined the Tigers for a fantastic weekend in ATL. The Tigers recharge and get ready to host the East Coast Conference Tournament at home turf in Raleigh, North Carolina for the weekend of June 24. Don’t miss out on the great action as many teams from all over will be attending. Details to come! 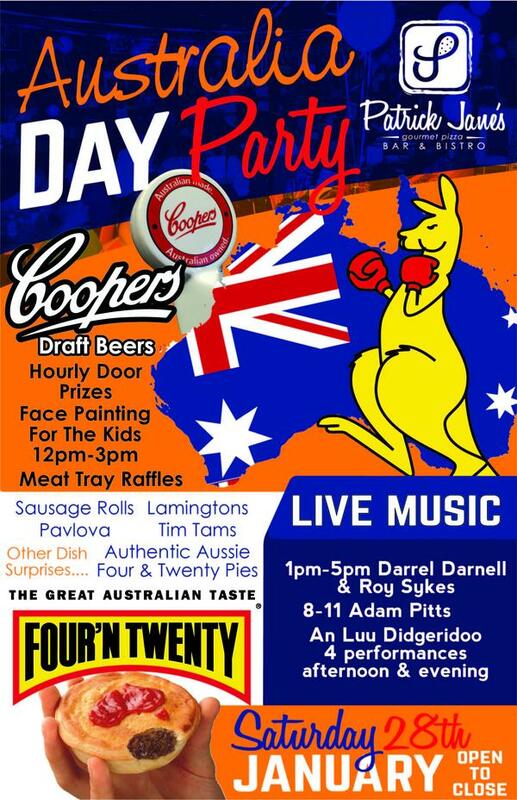 Come celebrate Australia Day with the NC Tigers! The event will be held at our fantastic sponsor Patrick Jane’s Bar & Bistro on Saturday, January 28 starting at 2 PM. Let’s start out the 2017 season with sharing great food with family and friends. See you there! If you can’t make it down to Sarasota for the games, wear your favorite NC Tigers gear to support the team in spirit! NC Tigers host their first night Metro game on a crisp October night. Tigers took the field at 7 PM with great numbers! The black team dominated the first half with newcomers putting in the work. Mike and Pete, who were on the black team, worked the middle without much contest that led to many early goals. After players swapped teams, the white team began to make a comeback, but didn’t have enough to take the lead as they lost 78-42. After the scrimmage, grill-master Shane cooked some fantastic hot dogs and everyone enjoyed some cold refreshments. Stu brought home a sack full of hot dogs as a snack for later. All in all, it was a great night for footy and thanks to Scott and Red for umpiring! Saturday was a great day for football and a magnificent win for the North Carolina Tigers! The Kookaburras showed up with a solid team, which made for a tight game in the third quarter, but the Tigers broke away in the fourth quarter. 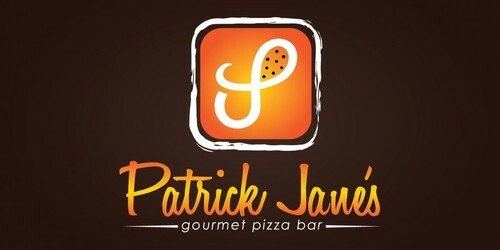 After the game, family and friends reconvened for fantastic food at Patrick Jane’s Gourmet Pizza Bar & Bistro. With motivation behind the team, the NC Tigers are traveling to and looking for revenge against Baltimore Washington Eagles Australian Rules Football Club on September 17. 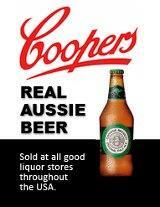 So relax this Labor Day weekend, have a Coopers beer, and recharge for the Eagles!